The GBMC super secret training camp video has been released and you can now witness the intense training that Sergeant At Arms John Cuthbert has been put through by GBMC President Davie Easton in preparation for The British Beard and Moustache Championships in a few weeks time. Our Big Cartel shop is Open! You've been waiting for this! 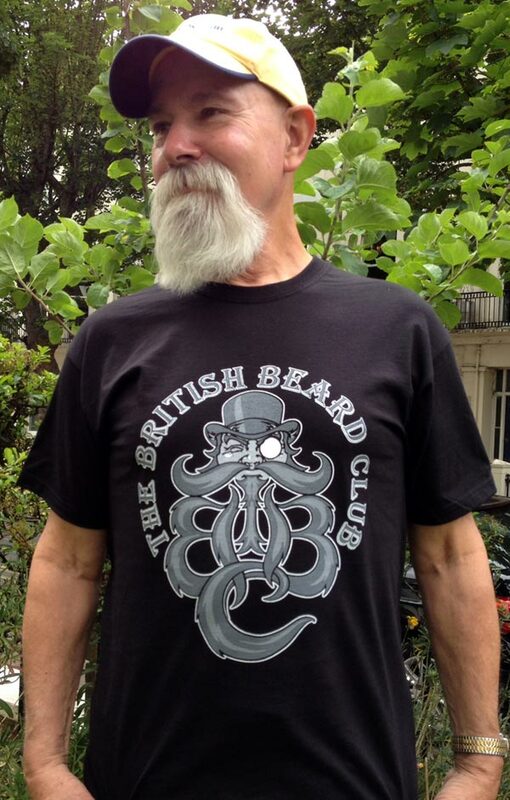 Our Big Cartel Club Merchandise shop is now open, so pick up our superb new TBBC T-shirt at the UK P&P inclusive of £15 each. The Big Cartel Shop price for Overseas members is £20.00 which includes shipping by Royal Mail International Standard. Carry home your shopping in one of our new TBBC Tote Bags. Only £5.00 each. All proceeds from the sale of our T-shirts and Tote bags will go to our chosen charities, so by buying these you will be supporting really worthy causes. 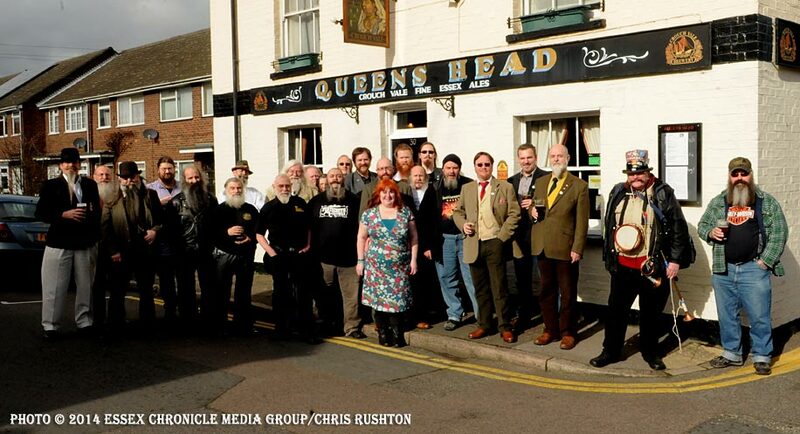 Our 5th Anniversary meet, hoisted by The Essex Beardsmen, the first and original Thatch of the Club, took place on Saturday 15th February at The Queens Head, Lower Anchor St., Chelmsford. The very first Meet of The British Beard Club took place on the evening of February 13th 2009 at The Cockpit in St. Paul's, a delightful little London pub sticking out like a big nose on the corner of St. Andrews Hill and a narrow alley. 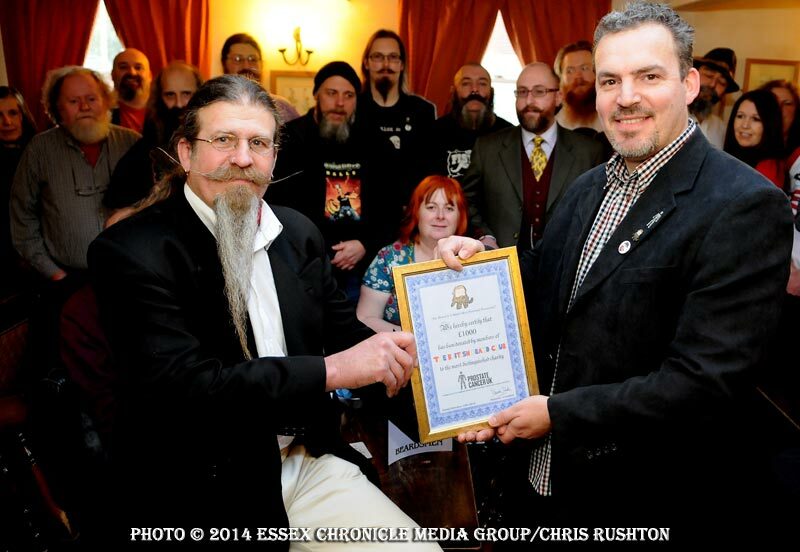 The Essex Beardsmen I unconsciously dubbed them then, and so they are now - and for all time! 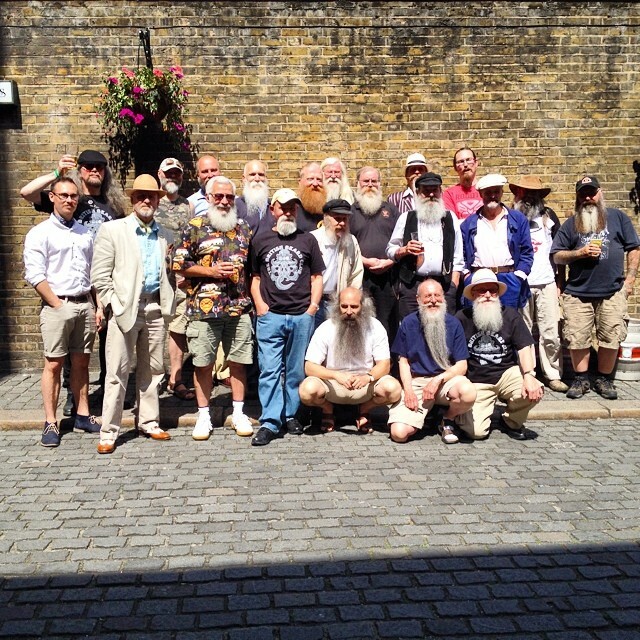 In celebration of that initial Meet, our Essex Beardsmen have hosted a TBBC Meet every year on the Saturday nearest that date, in Chelmsford, Essex - God's Own County, they will tell you. This year's meet was hugely successful with around 40 attendees, mingling with reporters and photographers from The Essex Chronicle. Founder member Frazer Coppin presented a certificate representing the Club's donation of £1000 from members subscriptions to Trevor Parrett, representing Prostate Cancer UK. The Essex Beardsmen were showing and selling their colourful baseball shirts, and a great time was had by all. 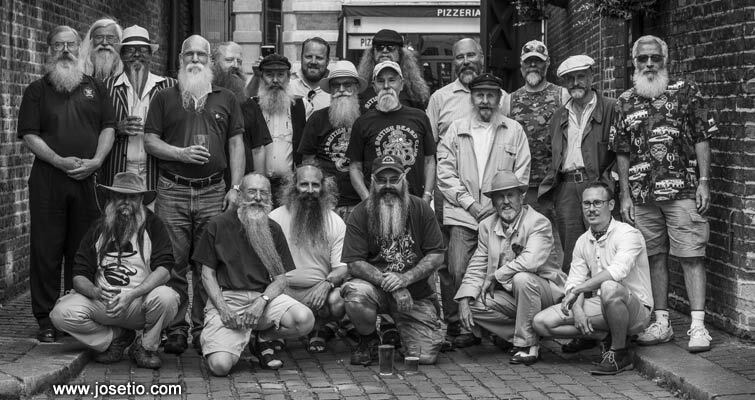 On Saturday September 6th 2014, Liverpool's favourite Beard and Moustache Contest was back for a third time, offering BEER & RESPECT to winners! “Followed by at 7pm the only beard contest in town hosted by moi - the tashwag - and starring the best facial hair in town ya'll ^_^ Did you register yet? Or will you be a winner BeerdFester? This year we'll be giving prizes out to not only Best Beard Moustache Partial and Fake, but also for Best BeerdFester, Baltic BILF and Beard Worth Talking About! “The contest is FREE to take part, and just £3 to attend. And it's not just for boys, the Best Fake award (for ladies and babyfaces) is hotly contested, very creative and most entertaining! Full members of the Club who have not received one of our brilliant Third Edition Members' Pin Badges (right) as part of their subscription can now buy one from our Web site Members Lounge. The price for UK members is £4.00 which includes postage and packing, with delivery by Royal Mail First Class. For European Members and those in the Rest of the World, the badge costs £6.50 including shipping, with delivery by Royal Mail International Standard. Please make your Overseas PayPal transaction in Sterling currency. You will probably be charged a small additional currency conversion fee. For UK members, if you'd prefer to pay by cheque or direct BACS transfer, send us your choice in an e-mail together with your Full Name, Membership Number and Postal Address. Note that we can only accept cheques in Sterling (£ or GBP) currency. Yorkshire Beard Day 2014 will take place on Saturday March 22nd 2014 at the Scarborough Spa Complex, Scarborough UK. You are invited to spend Saturday At The Seaside in the company of Yorkshire Beards, Real Beer and Family-friendly Fun. All are welcome. There will also be a Beard Portrait competition, Beard Photo Competition, Bearded Bands, Beer Tasting, Vintage Vinyl Records played on wind up Gramophone Players, Family-friendly Fun and Games and Prizes galore, including prizes for best fake beard for those of you unable to grow your own. Fake beards can be made by yourself or purchased on the day with profits going to the charity Prostate Cancer UK. 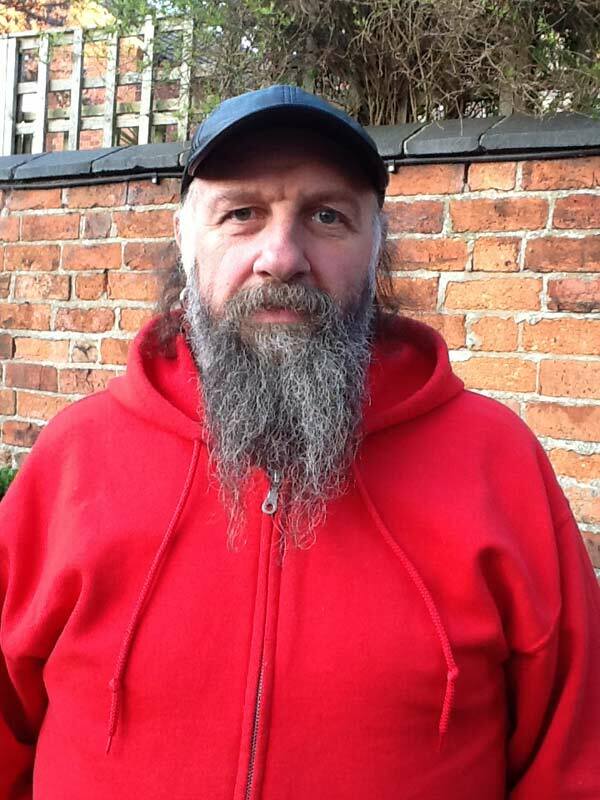 At 6pm there will be a Bearded Banquet whilst the judges decide the beard category winners and then at 7:30pm the title of Yorkshire Beard 2014 will be announced. More details of the After Party Venue and other information can be found on the Event Web site below. The New Members GALLERY has just been updated with 18 New Members' photos. Click the image above to go there. Leigh-on-Sea, EssexDarren Hayward joined us in April. 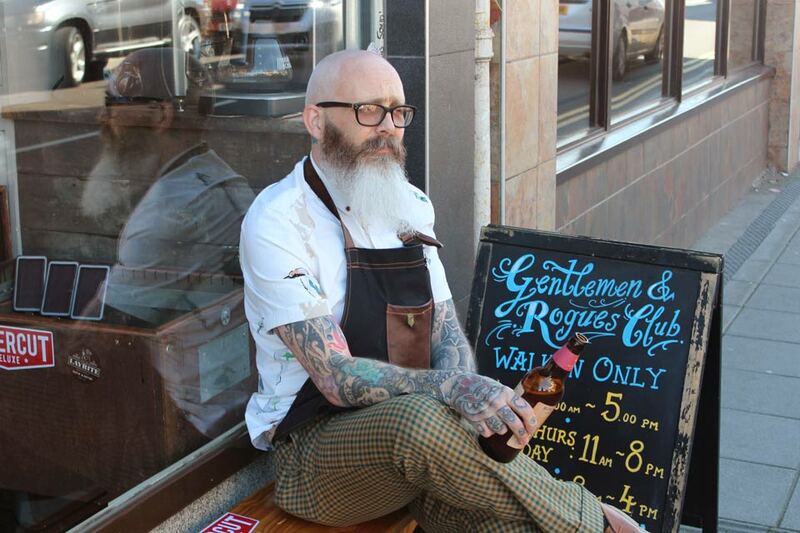 Darren is into tattoos, his wife and family, his ukulele and runs Scissors salon in Christchurch. Kettering, NorthantsLin re-joined the Club in April.